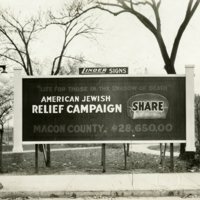 Photo of a billboard sign for the American Jewish Relief Campaign. 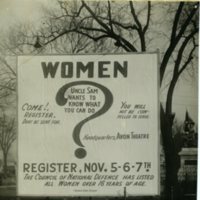 Sign says: "Life for those in the shadow of death" American Jewish Relief Campaign. Share. Macon County $28,650.00. 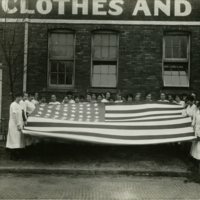 Schudel Employees with flag. Early days of the war. 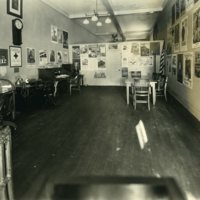 Description and page number of location in book are written on the left side of the photo. 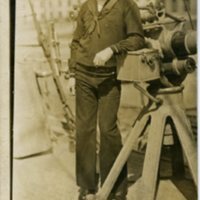 "Women, Uncle Sam Wants To Know What You Can Do"
Thomas Daly - WWI sailor on the U.S.S. Connecticut. Photograph of Thomas Daly on the U.S.S. Connecticut. 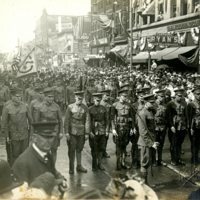 This Decatur native served on this battleship as a fireman during World War I. 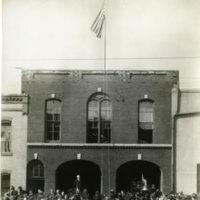 Photograph of the ceremonial flag raising at Firehouse #1 in Decatur, IL. 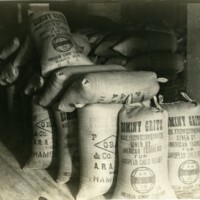 Wording at the top of the photograph denotes the topic of the photograph and where the photo can be found in the book. 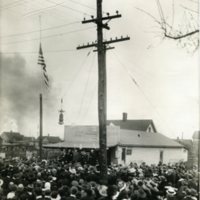 Photograph of the raising of the flag at Skugiva Grocery at 1501 E. Marietta St., Decatur, IL c. 1917. Wording at the top of the photograph states topic of the photo and where the photo can be found in the book. Food poster on Courthouse with two cars below c. 1917. 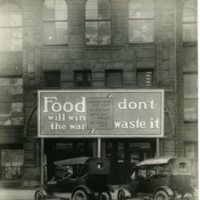 Poster states: "Food will win the war. Don't waste it." 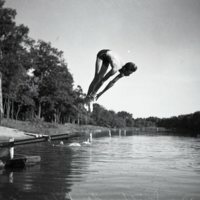 Negative of an unknown man diving into the lake at South Side Country Club while an unknown woman looks on.